4 July 2012, Singapore – Where can motor sport fans find 100 of the world’s finest racing cars for the price of a single ticket? At the Marina Bay Street Circuit, where no fewer than three top-line racing series will provide the back-up to the fifth running of the 2012 FORMULA 1 SINGTEL SINGAPORE GRAND PRIX from September 21-23. Heading the list, and making its first visit to the stunning Singapore street circuit, is GP2 – the series which in its seven seasons to date has proved itself as the category of choice for future Formula One stars. Take a close look at the 2012 Formula 1 World Championship entry list and you will find no fewer than 12 drivers – that’s exactly half the field – who have graduated from the ranks of GP2. In fact six of them are drivers who won the GP2 title before moving up. Foremost among them are 2008 Formula 1 World Champion Lewis Hamilton, who took the GP2 title in 2006 and won the Singapore Grand Prix in 2009, and two men who have just claimed their maiden GP victories. One is Mercedes star Nico Rosberg, winner of the inaugural GP2 series back in 2005, and the other is Pastor Maldonado. Maldonado, the 2010 GP 2 title-winner, took the first-ever Grand Prix win by a Venezuelan in Spain in May to secure the first Williams F1 victory since 2004. "The emphasis for us," says Mario Isola, Pirelli’s racing manager in GP2, "is on teaching our young drivers everything they need to know about the top level of racing," so it would seem they have gone about it in the right way! GP2 now mirrors Formula One more closely with the same points breakdown for their feature race each weekend, while Pirelli has added an option tyre to the four sets available to each driver to make strategy and race planning as important as it is for the Formula One boys. The series was hailed in 2005 as "one of the brightest motor sport innovations since the combustion engine" and as Singapore spectators are about to find out, it has only gotten better.. And the best thing about it is that Singapore will stage this hugely competitive series’ final round. Among the current crop of GP2 competitors, series veteran Davide Valsecchi is enjoying a brilliant start to 2012. The Italian DAMS driver led the standings by 25 points after Barcelona, where Arden International’s Luiz Razia of Brazil stormed home in the sprint race to be just 25 points adrift of Valsecchi overall. The man behind the series, Bruno Michel, can’t wait to see his young charges take on the Marina Bay challenge. "We are very pleased to bring GP2 to Singapore," he says. "Every year the Formula One Grand Prix at Marina Bay Street Circuit is one of the most exciting races of the season and I am convinced that our Series will bring the same level of excitement and action. "It is a beautiful and challenging track; I am really looking forward to seeing our young drivers race in the streets of Singapore." Is there a more evocative name in motor sport than Ferrari? While current Maranello star and two-time Singapore winner Fernando Alonso goes for glory in the major race, a whole field of Ferraris will also be gracing the Singapore streets for the first time. They are the magnificent 4.5-litre V8 berlinettas in the Ferrari Challenge Trofeo Pirelli Asia Pacific 2012, and they too will bring their championship-closing fifth round to the Marina Bay Street Circuit. A field of 30 of these 570-horsepower machines will be a stunning sight under the Singapore lights as a mixed group of ‘serious’ racers and gentleman drivers bring the unmistakeable sounds of Maranello to the Far East. In the Ferrari 458 Challenge the cars may look amazing – but the drivers are the key components, whether in the Trofeo Pirelli for more professional drivers, or in the Coppa Shell for ‘gentleman’ drivers. After three rounds of the 2012 series Italy’s Philippe Prette, with two race wins, led the way by eight points from Japan’s Hisamora Hayashi, another double winner, with Thai driver Pasin Lathouras third, a further 10 points behind. In the Coppa Shell it was Hong Kong driver Alex Au who had the upper hand, leading Canadian Eric Cheung by eight with Singapore favourite Gregory Teo in third place. Each car is set up in advance to optimise performance at the race-track over the weekend, leaving the men behind the wheel to make the difference – and the same could be said of the third of these three outstanding support categories at the Marina Bay Street Circuit in 2012. 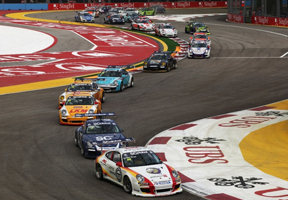 Back for its fifth year on the Singapore Grand Prix card is the Porsche Carrera Cup Asia, which brings a field of over two dozen 911 GT3 Cup cars contesting the 10th season of this immensely popular one-make category. Series spokesman Oliver Schwab, Motorsport Manager at Porsche China, is looking forward to another Singapore street fight. "As the region’s premier sportscar series," he says, "the Porsche Carrera Cup Asia is thrilled to once again be a part of the jewel in the crown of international motorsport in Asia. "A true test of man and machine, the demanding Marina Bay Street Circuit gives our drivers a tremendous opportunity to both showcase and test their skill." 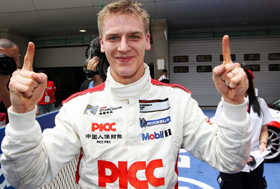 The 2012 Porsche Carrera Cup Asia campaign was launched on the back of a brilliant 2011 series won by Japan’s Keita Sawa. The LKM Racing driver returns to defend his title against serious competition including the man he pipped by a single point last year, Team Jebsen’s Rodolfo Avila. 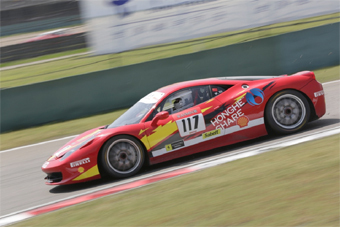 The 2012 field is enhanced by the arrival of former Formula One test and development driver Ho-Pin Tung, whose partner in the Team StarChase line-up is Alexandre Imperatori, winner of no fewer than eight races in his 10 PCCA outings last year. Imperatori, Swiss but Shanghai-based, has thrown down the gauntlet to his rivals with a brilliant run of four straight victories in the opening four rounds in Shanghai and Zhuhai, taking pole position at each venue. He enjoys a 20-point lead over 2011 champion Keita Sawa of the LKM Racing Team. Last year’s Class B winner Wang Jian Wei of Team BetterLife moves up to the main game in 2012 along with the series’ lone female driver, Rose Tan, an impressive debutante in 2011. "With the Singapore event coming towards the climax of our 2012 season, the competition is going to be at its most intense so it is going to be truly electrifying to see 28 Porsche 911 GT3 Cup sportscars roar off the grid," said Schwab. Few cars look better suited to street circuits than the muscular, road-hugging 911 – and no street circuit offers a better stage for this combative category than the Marina Bay. Tickets are available for sale online at www.singaporegp.sg, via the ticketing hotline +65 6738 6738 as well as at all authorised travel agents.